Elsa get over with all these responsibilities and being nanny so she put someone else in charge and she takes a day off to spend some time with her daughter. 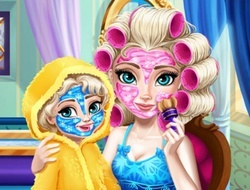 This game is one of that girl games and frozen games where your designer, hair stylist and beautician skills are tested . Try to make her look like herself again because she forget about her guise lately. Start with a mask for face and continue with some treatment for her messy hair. Don't forget about her make up and her outfit, because if it fits and she and her little girl like the way you change her it means you we're doing a good job. Have fun while you help Elsa to decide what is going to wear and which hair style suits her better. Elsa Mommy Real Makeover 0.00 between 0 and 10 based on 0 votes.